The MAN Group has just concluded a new partnership with another First League German soccer team: Right in time for the new soccer season, the 1. FC Kaiserslautern and the Munich DAX 30 company are beginning an agreement for the next years. For the "Red Devils", this means that after their return to the First League, they will be moving into a first-class team bus. 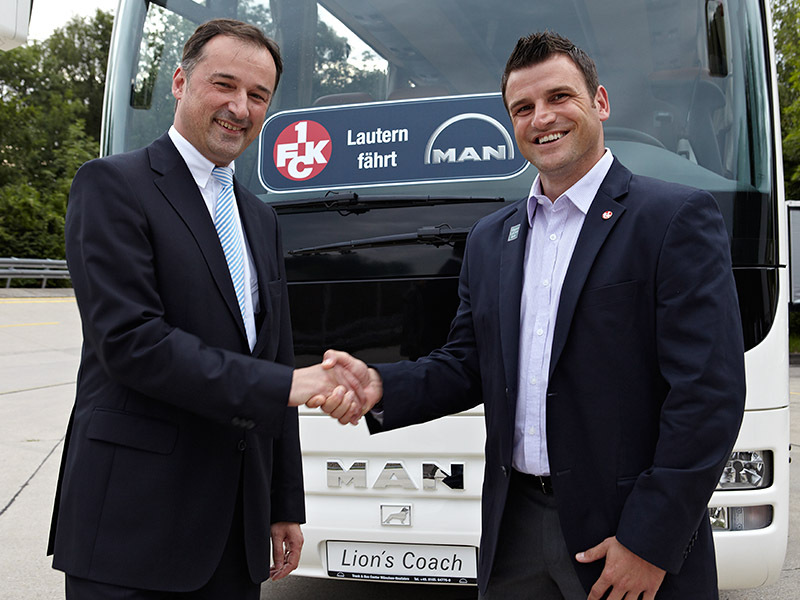 Now, the FCK will be traveling in a new, exclusive MAN Lions Coach bus to its games. "The 1. 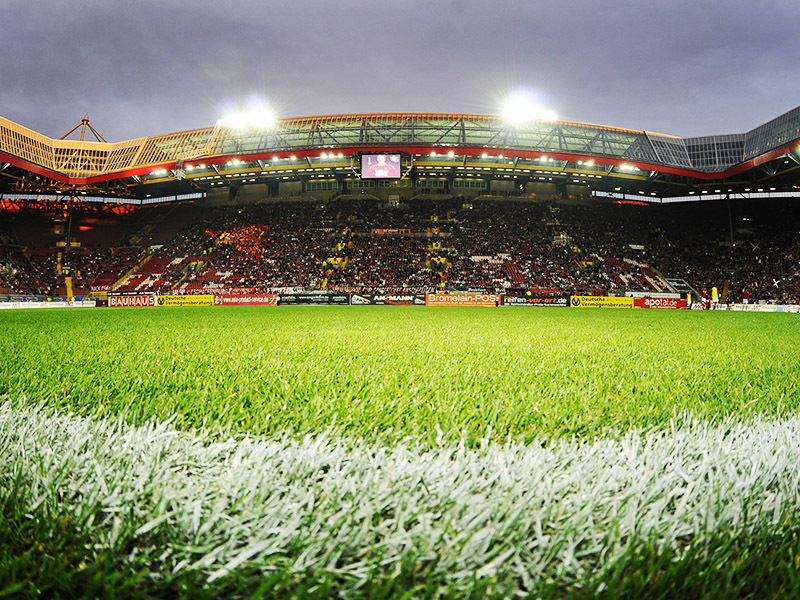 FC Kaiserslautern is one of the most popular traditional clubs in the German soccer league. We are proud to be accompanying the FCK on its successful path after its return to the upper echelons of soccer. Our exclusive team bus provides the FCK with first-class travel accommodations," says Dr. Frank Hiller, Head of Sales at MAN Nutzfahrzeuge AG. After FC Bayern München, the Hamburger SV and the VfL Wolfsburg, Kaiserslautern is the fourth First League team that the Munich commercial vehicle and engine manufacturer is partnering with. Stefan Kuntz, 1. FC Kaiserslautern Manager says, "Our goal is to reestablish the FCK in the First League. To achieve this goal, professional, first-class partners are necessary. We are especially happy to have support from Munich: with MAN, we have a new, strong partner on our side. This team bus offers our pros the greatest possible comfort and thus, the best prerequisites for bringing top performance and achieving our overriding goal of staying in the First League." The 1. FC Kaiserslautern is famous for its loyal fans. This is why MAN and the FCK have planned many attractive fan activities related to the theme "the legendary team bus". Fans can, for example, pick a name for the Red Devil's new team bus. During the next weeks, FCK fans can go to the team's website, www.fck.de, and e-mail their suggestions for the bus name to fck@MANschaftsbus.de. The best ones will be published on the FCK's site for final voting. The participant whose suggestion gets the most votes will win. The prize: the fan's presence as a "godparent" at the naming ceremony of the FCK team bus at the fair for commercial vehicles IAA in Hanover in late September. Another high point is that 28 FCK fans will have the chance during the coming season to ride along in the MAN team bus of their favorite team to a game away from home. MAN and the FCK will offer this exclusive trip during the course of this season, and fans will be able to compete for it. MAN and NEOPLAN-brand buses already transport many top soccer teams throughout Europe and Latin America to their games. The FC Chelsea, FC Zenit St. Petersburg and AC Mailand rely just as much on MAN's luxury buses as does World Champion Brazil – with five victories – and nearly the entire Brazilian soccer league, which has 15 teams. In Germany, nine of 18 First League teams ride in MAN buses. Team buses have become an important part of pro soccer. They are the place where players spend their last quiet moments, where they can concentrate before a game. After the games, they can either celebrate their victories or come to terms with their defeats in these buses. The FCK team bus is exclusively equipped and fulfills all demands for modern travel. With 440 hp, the MAN Lions Coach can win trophies for the 1. FC Kaiserslautern all round: a total of 28 seats over a total length of 13.8 meters offer more than adequate legroom. Tables and legrests are electrically adjustable for the greatest possible comfort. The kitchen area in the middle of the bus is completely equipped with the most modern kitchen devices to enable pre-paration of both food and drink. Four refrigerators ensure that players always have adequately cooled drinks as well. Four 19-inch monitors with DVD players including a multi-channel sound system enable players to watch relaxing films or get ready for the game. Coach Marco Kurz has a special seat from where he can feed a video presentation into the system and give team-members last-minute tactical instructions. And with wireless LAN and 220-volt connections at every seat, every player can use his laptop for relaxation.